PlayStation is always full of content! Sony Computer Entertainment Japan Studio has made a community announcement for fans following Bloodborne. Below you can read the announcement and feel sad in the process! 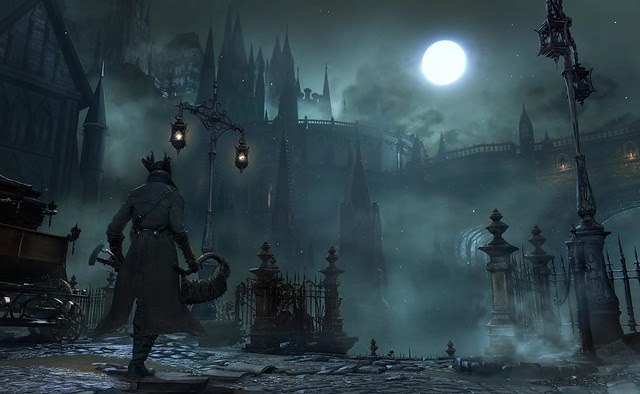 It is with regret that I (Producer, Masaaki Yamagiwa) must inform you that Bloodborne will be slightly delayed. Relativity is the fruits and labor of indie game developer Willy Chyr from Chicago. Willy has been single handedly working on this project as the Developer and Designer for the game. Relativity will be at the PlayStation Experience event in….. well, read his announcement below to find out the news! Hello! My name is Willy Chyr – I’m an artist and indie game developer based in Chicago. I’m happy to announce that my game Relativity will be coming to PS4 in 2015, and you will get to try it at PlayStation Experience next month in Las Vegas! Relativity is a game that re-imagines the laws of the universe. What if the normal rules of gravity no longer applied? The basic mechanic of the game is the ability to change gravity, allowing you to re-orient yourself to walk on walls and ceilings. In this world, up is down and down is up. It’s all relative. Let’s take a look at what an early puzzle in the game is like. In the gif below, we need to get the purple block to stay on the purple square in order to unlock a door, but the block keeps sliding down. The solution: we lock the blue block in place while in the blue gravity, and then use it as a shelf to hold up the purple block. What you just saw is the basic gameplay mechanic. But Relativity is more than just about stacking cubes – there is an entire world full of wonder and impossible architecture for you to explore. For example, because there is no up or down, the world of Relativity is a floating platform. So what happens when you fall off? Instead of fading the screen to black and re-spawning you, the world actually wraps around on itself, so you simply land back where you fell off from. This is just one of the many interesting elements that you’ll discover in Relativity. My goal is to create an experience that is both mind-bending and visually compelling. Each puzzle is carefully designed to challenge the player and be incredibly rewarding. I hope to see you at PlayStation Experience! If you want to be notified of Relativity’s release, keep an eye on PlayStation.Blog or sign up here. Let me know if you have any questions in the comments, and I’ll do my best to answer them. Stranded after his ship is destroyed in deep space by a strange anomaly, Harrison, a lowly maintenance worker and our hero, must struggle to survive. PixelNAUTS’s pathetic hero, Harrison, must take matters into his own hands in order to find salvation quickly before he freezes, or starves to death in the depths of space. There is a lot of motivation in Lost Orbit to go fast. Not the least of which is that it’s fun. Lost Orbit presents you with simple to learn mechanics that, once mastered, will enable you to blaze through levels. Upgrading Harrison’s kit allows players to customize their play style, gaining new tools to handle the dangers of space. As your confidence grows, so does your willingness to fire Harrison between the tightest of gaps. Confronting your mortality and surrendering to the compulsion to blast through systems is extremely satisfying. And, when you cross the line into overconfidence, the harsh realities of space travel will rip you out of your little bubble. Space travel is dangerous, and the universe of Lost Orbit is no exception. There is no baby proofing present. As a lone, ship-less astronaut, you are extremely vulnerable. Lost Orbit is challenging and you will die a lot, but PixelNAUTS wanted to create an experience where players didn’t feel punished for dying. Dying in Lost Orbit happens quickly, is humorous, and is easy to recover from. Players can watch their mangled body float away while they shed tears over the loss of life, or respawn instantly, getting right back into the action. The game feels suspenseful without the dread of a frustrating five minute post-death cinematic. Risk it all for your chance at survival. After all, everyone has to die sometime. When you find yourself curled in the fetal position, clutching a pillow, and unable to cope with the loneliness and death of space travel, hope is not lost. Lost Orbit has a wealth of serene beauty to explore while you recover. Moments of reprieve will coax you out from under your blanket fort. When PixelNAUTS worked with Vigil on Darksiders, they were surprised at how much fun we had just running around an empty room with the finished character: War. His movements and attacks had a lot of variety and weight to them. The same way a go-kart in a parking lot can be great fun, so too can the basic locomotion of a player character. PixelNAUTS really tried to impart that level of refinement into Lost Orbit . There are plenty of moments for the player to take in the beauty of the game, and lazily float and dart their way through open space. It’s a good balance for the white-knuckle twitch-fest that is the meat of the game. Lost Orbit will be available on PS4 in early 2015. The game will be playable at PlayStation Experience in Las Vegas, December 6th and 7th. If you have the chance, come see us, and die alone in space. Since launching TowerFall, Matt Makes Games Inc. had countless requests for new levels, characters, power-ups, and modes. A lot of your suggestions have been really valuable, and after recovery from the game’s launch back in March, Matt Makes Games Inc. began forming new ideas of their own. Slowly but surely, they’re plans for an expansion took shape. Matt Makes Games Inc. is excited to announce that the Dark World Expansion will hit PS4 in early 2015. Matt Makes Games Inc. wants to call this an expansion rather than DLC, because it expands the game in every direction rather than providing small incremental additions. Approaching it this way allows them to tie all the new stuff together in a very cohesive manner. For fans, this means more playable archers, levels, modes, power-ups, variants, trials, and more. Joining the roster is the red archer, the Vainglorious Ghoul. As her appearance suggests, she captains an infamous ghost ship known as The Amaranth. The Amaranth, it turns out, is also one of four new level sets in the expansion. These new locations are spread across the Dark World, a twisted reality parallel to the TowerFall world you’re familiar with. The final tower, Cataclysm, uses procedurally generated levels to make sure every match is unique and surprising. And then there’s the new power-ups, such as Trigger Arrows, which behave like remote mines. Stick them to walls or ceilings in clever positions, wait for the perfect moment, and detonate when your opponents least expect it. Or the otherworldly Prism Arrows that lock your enemies in magical prisons so they have nowhere to hide. These are a few highlights from our work so far. If you want to keep up on development and read about everything we’ve added, check out the TowerFall blog where we’re posting regular updates on the expansion. We’re already having a blast playtesting these additions — they open doors to countless new ways to trick your friends, and countless, more hilarious outcomes. With so much excellent community feedback, we have a great handle on what players love about TowerFall, and see this as the perfect opportunity to push the game to its limits. I’ll be at PlayStation Experience in Vegas next month, taking all challengers as we demo the Dark World Expansion for attendees. That is all for this week folks! Make sure to check back with us for more updates in the future!